The United States Agency for International Development (USAID)’s Scaling Innovations in Mobile Money (SIMM) project—implemented by DAI—will lead the pilot. Eric Postel, USAID Assistant Administrator for the Bureau of Economic Growth, Education and Environment, Gloria Steele, USAID Philippines Mission Director, and Sherwin Gatchalian, Valenzuela City Mayor, were on hand Nov. 7 at a signing ceremony to launch the pilot program. With its partners BPI-Globe BanKO, G-Xchange, and Smart Communications, the SIMM team will assist the government of Valenzuela in integrating mobile money into its existing payment system, allowing citizens to transact with the government using mobile technology. SIMM will also work with the business sector and microfinance institutions in Valenzuela to enable mobile money for payroll and payments. Transferring the city’s financial transactions to a mobile system will cut administrative costs, increase transparency, reduce potential leakage of government funds, and make doing business with the government easier for citizens—in a country where 100 percent of the citizens reportedly have mobile phones. Mobile money is increasingly becoming a cost-effective and transformative tool for increasing transparency and efficiency in governance. “Valenzuela City, under the leadership of Mayor Gatchalian, is on the cusp of game-changing developments—embracing technology-driven innovations to further enhance business processes to make government operations more efficient, more transparent, and more responsive to the needs of its citizens,” Postel said. The project is expected to benefit 130,000 households and 64,000 formally employed citizens in Valenzuela City. SIMM targets three key areas: payment of government services, payroll distribution, and payment of private services, such as utilities. It will initially cover real property tax payments and later include payment of community tax certificates, business permits, market fees, and other local government fees. 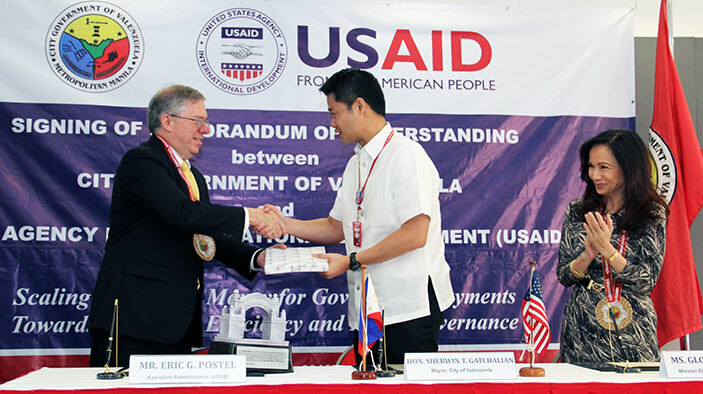 SIMM “supports USAID Forward, an initiative which focuses on innovation and the application of technology to achieve high-impact development,” said Postel.